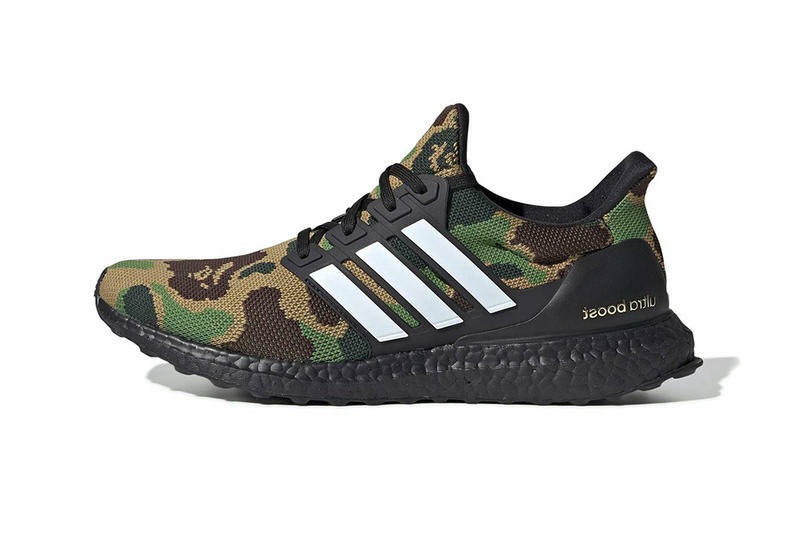 After a few closer looks, frequent collaborators BAPE and adidas have finally unveiled the official imagery for their highly-anticipated UltraBOOST silhouette. Featured in two distinct colorways, one dressed in signature 1ST CAMO while the other takes on a “Black” makeover, each model’s Primeknit upper is swathed in BAPE’s ubiquitous camo print while the German’s Three Stripe branding is prominent on the TPU cage. A black heel cap, murdered-out BOOST midsole, gold co-branding, and an APE Head tongue tab decor decorated like the American flag with STAS in place of regular stars round out each pair. The BAPE x adidas UltraBOOST are expected to drop on February 2, just ahead of Super Bowl LIII. The collection will also comprise of a football jersey, helmet, pigskin football, and the adidas Adizero 5-Star cleat. Take a look at the official imagery above. In case you’ve missed it, here’s a closer look at the BAPE x adidas Football Collection. And in related news, BAPE dropped cozy blankets for its VIPs.